FNS, Caribbean Area Office Director Carlos Ortiz-Medina (upper right) answers a question from Mid-Atlantic Regional Administrator Pat Dombroski as residents work their way through registration process at the Puerto Rico Convention Center in San Juan, March 19. Hurricanes Harvey and Maria left a catastrophic trail of widespread flooding and loss of power. Especially hard hit were our two Caribbean territories, still now recovering from the damage caused by the one-two punch from Hurricane Irma in early September and Hurricane Maria just two weeks later. With winds of up to 155 mph, Maria, a powerful Category 4 storm, plowed across Puerto Rico uprooting trees, downing weather stations and cell towers, and ripping wooden and tin roofs off homes. The entire island lost electrical power, while access to food and clean water became limited for most. Despite these challenges, people came together to help their neighbors – clearing debris, sharing resources and providing assistance to those in need. Throughout this, the people of Puerto Rico committed to rebuilding their communities, even making them better than before the storm. In the immediate aftermath of Maria, the Food and Nutrition Service provided food assistance during the relief efforts in Puerto Rico. This was accomplished through the Disaster Household Distribution program, as well as through flexibilities in the school meals programs and the Special Supplemental Nutrition Program for Women, Infants and Children. For months following the hurricanes, the storm’s effects are still being felt by many and most families and businesses are still facing hardships that have crippled both industry and employment. 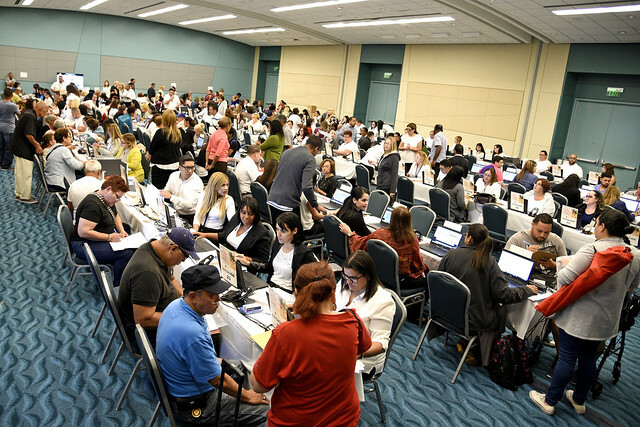 Puerto Rico residents applying for temporary Nutrition Assistance Program benefits are screened for eligibility by program technicians at the Puerto Rico Convention Center in San Juan, March 19. As part of the additional supplemental appropriations for Disaster Relief Requirements Act of 2017, USDA was able to provide Puerto Rico with a $1.27 billion disaster relief grant to provide temporary Nutrition Assistance Program (NAP) benefits to its eligible citizens. These funds allow Puerto Rico to expand assistance to more households and temporarily increase benefit amounts for new and current participants. Our dedicated Caribbean Area Office staff continues to support the recovery efforts, working closely with Puerto Rico’s Department of the Family to provide temporary NAP benefits. 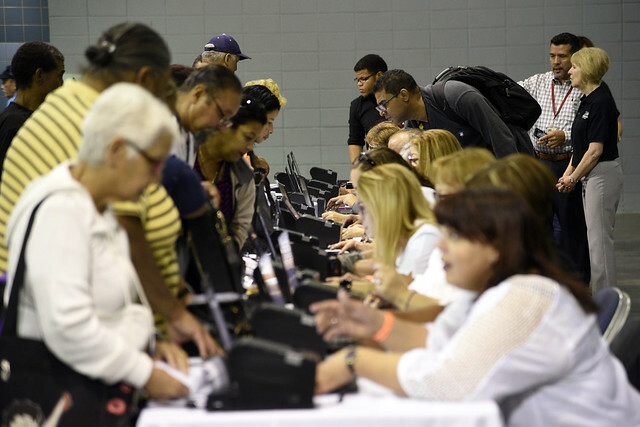 On March 19, I visited Puerto Rico to observe the first day of sign-ups, as residents began the registration process at the Puerto Rico Convention Center in San Juan. Our staff partnered with local government to help ensure a smooth process, helping guide residents through what can be a confusing and overwhelming time and sometimes just offering an ear to their stories. Many thanked us and let us know how the assistance will help them get back on their feet. Additional registration sites opened in Aguadilla, Arecibo, Bayamon, Caguas, Carolina, Guayama, Humacao, Mayaguez and Ponce and registration continued through the end of April. For those unable to visit a registration site, applicants were able to apply at their local NAP office. The island’s situation is steadily improving. While most residents have regained access to basic essentials, the road to recovery is long, and many still need help. USDA is working diligently to reduce hunger and increase food security for everyone. By providing children and low-income people access to food and a nutritious diet during difficult times like these, we’re on the right path. 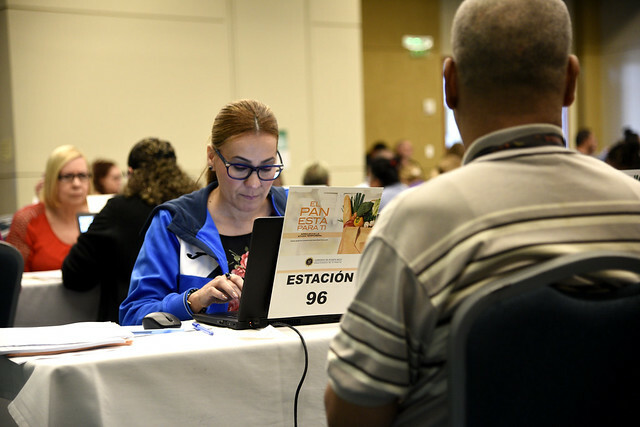 A program technician reviews an applicant’s eligibility for temporary Nutrition Assistance Program benefit at one of the processing stations in the Puerto Rico Convention Center in San Juan, March 22. Are high school students in Puerto Rico able to graduate or have the effects of the hurricanes delayed graduation for the class of 2018 seniors?